You can export data from any SalesforceIQ List you’re collaborating on to a new Google Sheet, or append the data to an existing Sheet. You can also export List data to a CSV file. 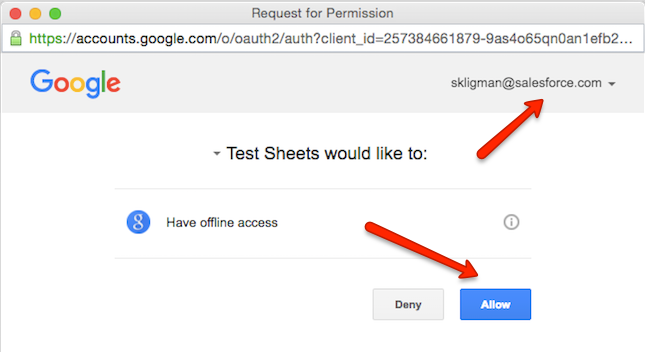 Note: You must have a Google account to export data to a Google Sheet. This can be a connected Gmail account or an account that is not connected to SalesforceIQ. If you enable List-level administrative controls, only Organization admins can export List data. From the Grid or Stream view, click the downward-facing arrow to the right of the List name. Click Export Grid > To Google Sheets, and then click the option to export to an existing Sheet (Choose File) or to a new Sheet (New File). A screen appears requesting additional permissions to your currently connected account. To export to a sheet using this account, click Allow. To use a different account, click your email address in the upper-right corner, click Add Account, and follow the prompts to sign in to a different account. To export to a new Sheet: Select New, enter the sheet name (or use the displayed default name), and then click OK. Select the folder where you want to save the sheet and click Save. To export to an existing Sheet: Select Existing, select the sheet you want to use, and then click Select. The data is added to the Sheet as a new tab with the name [List name] - [Month] [Day of month], [Year] [Hour]:[Minute]:[Second] [AM/PM]. For example, if you export an Opportunities List on June 1, 2016, at 9:00am, the tab name is Opportunities - June 01, 2016 09:00:00AM. Note: During the export to a new or existing sheet, a status indicator displays the progress of the export when you are on the List screen. If the original List is in a filtered view, only the filtered information exports to the Google Sheet, in addition to the fields mentioned in the preceding bullet. If the original List contains a File field type that has uploaded files, the file names appear in the Google Sheet after export, but the attached files are not included. You can export data from any SalesforceIQ List you’re collaborating on to a CSV file. 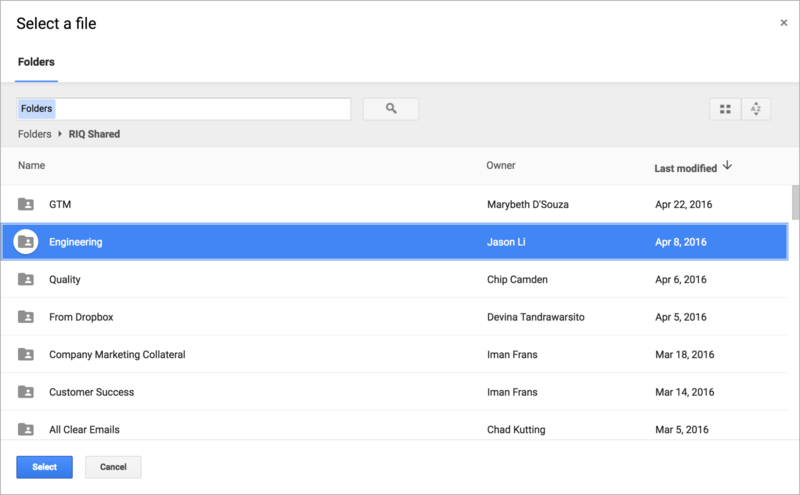 You can also export List data directly to a Google Sheet. Note: If you enable List-level administrative controls, only Organization admins can export List data. For any List, you can export either all the Grid data, or Contact data only. Export Grid—Select this option to download all the Grid data to a CSV file. Click Export Grid > To CSV. Export Contacts—Select this option to download just the Contact data from the List to a CSV file. Note: If you have multiple values for a Contact category—for example, multiple email addresses—the export process exports one value only. If you have set one of the values as primary (such as a primary email address), the process exports the primary value. If you don't have any value set as primary, the process exports the value you most recently added to the Contact. We recommend setting primary values before export to make sure you export the most useful value for each category. Need to export all of the data in your Organization? Follow these simple steps. Click General in the left navigation panel. Click Start Export. Only Organization admins see this option. SalesforceIQ's data export includes your Accounts, Contacts, List grids, and manually logged comments and events. All manually logged activity is included in the respective Calls.csv, Comments.csv, or Meetings.csv file. How do I move my data to Salesforce's Sales Cloud? Learn how to migrate your data to Sales Cloud here. Why don't we export automatically logged activity? SalesforceIQ captures every email and calendar event between your team and the external Contacts you track in your Lists. The large volume of automatically captured activity makes it difficult to be effectively shown in another CRM. Instead, our customers use the exported comments for key insights on their Accounts.